Double stack .45 power in a grip that rivals the size of the 226, the Sig P227 is the answer everyone has been waiting for. 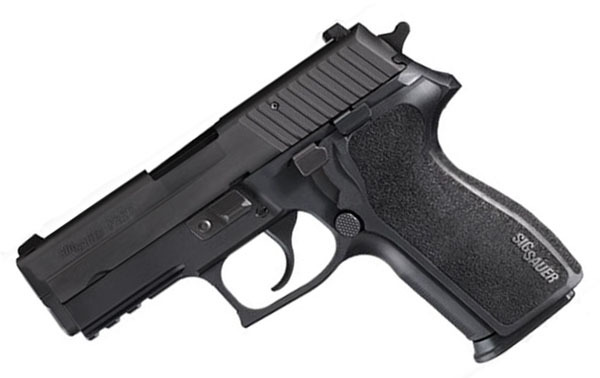 The ergonomic 227 is Sig's answer to a controllable, high capacity double stack .45ACP. Coupled with the E2 grip, it is hard to believe you have 10rds of .45 at your disposal! Featuring a 10rd standard capacity and an available 14rd extended capacity magazine that increases your capability to deliver multiple rounds on target. Carry version features a shortened slide for easier concealability. Great pistol,great service the guys at Top Gun are first class! I bought this gun a few months ago and have fired about 250 rounds. No failure to eject or failure to fire. I purchased the SRT kit with the P227 from Top Gun and had it installed by a gunsmith prior to fireing the gun. The SRT is well worth the additional investment. Top Gun service was excellent.